Noun Phrase adalah frasa antara noun, pronoun, atau number (berfungsi sebagai head) dan satu atau lebih modifier. Frasa ini digunakan ketika single noun tidak cukup spesifik untuk menunjuk suatu kata benda. 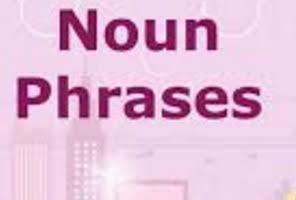 A noun phrase can be a single word-just the noun-or more than one word. Noun phrases can function in several different ways in a sentence. Some of the most common functions of noun phrases are listed below. Each of these phrases contains a noun (house, board, snow). The other words modify the noun. Examples of noun phrase as subject: The yellow house is for sale. The glistening snow covered the field. Examples of noun phrase as direct object: I want a skate board. Should we buy the yellow house? Examples of noun phrase as object of preposition: Jeff rode on a skate board. Karen lives in the yellow house. Example of noun phrase as indirect object: Lisa gave the little boy a candy. determiner, yaitu: pre (multiplier, fraction, distributive, intensifier, exclamative), central (article, possessive, demonstrative), dan/atau post-determiner (number, quantifier). head, yaitu: noun atau numeral/number. Pre-modifiers, merupakan modifiers yang ditempatkan sebelum head, yaitu: determiner, adjective (phrase), participle dan kata benda lain. Post-Modifiers, merupakan modifier yang ditempatkan setelah head, yaitu: prepositional phrase, participle, infinitive, relative clause dan complementation. The rich in the world who care with the poor.